Every dog deserves a happy mouth. Dogs live their life through their mouth, so keeping their teeth & gums healthy is critical for them. That's why Pedigree Vital contains a special active ingredient to help prevent the build-up of tartar and specially designed biscuit texture to help clean teeth. Every dog deserves a healthy tummy. 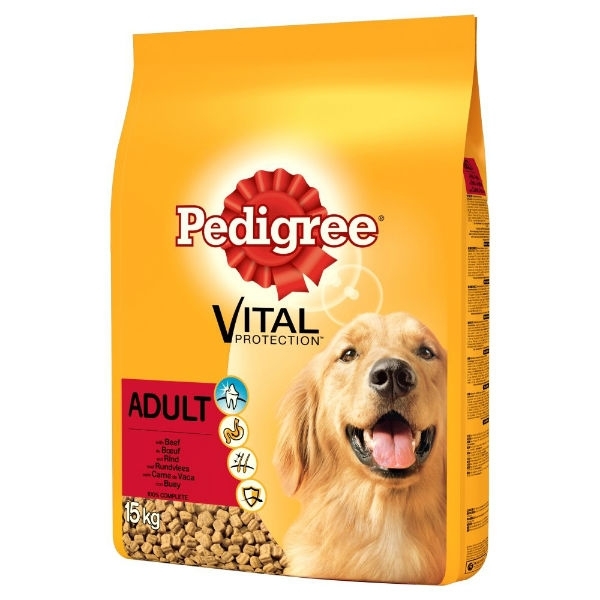 Pedigree Vital contains both natural fibres and high quality proteins, which support healthy digestion. Every dog deserves a strong immune system. Dogs like to sniff around and explore everything. Rest assured, as Pedigree Vital contains vitamin E, and antioxidant and minerals that are key to help support a strong immune system. Ingredients - Cereals (min. 4% Wheat), Meat and Animal Derivatives (min. 4% Beef In The Beef Kibble), Oils and Fats,Vegetable Protein Extracts, Derivatives Of Vegetable Origin (min. 3% Dried Beet Pulp), Minerals, Vegetables (min. 4% Carrots In The Carrot Kibble, min. 4% Beans In The Green Kibble).